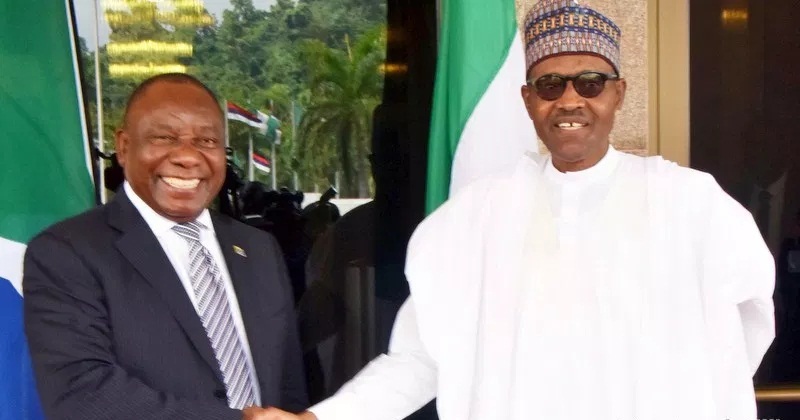 The South African President, Cyril Ramaphosa, who visited President Muhammadu Buhari in Abuja on Wednesday, has given reasons for his first trip to the Nigerian capital. 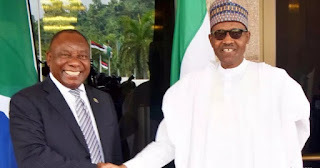 Mr. Ramaphosa, who addressed the press after the meeting, said his trip to Abuja was the first outside the Southern Africa region. Mr. Ramaphosa, who was the leader of the governing African National Congress (ANC) party, assumed office as South African president on February 15 following the resignation of former President Jacob Zuma. He said he decided to visit Nigeria, first to send a signal that his government intends to pursue an Africa focused foreign policy. “But in pursuing that African focused foreign policy, we would like to deepen our relationship with Nigeria, seeing that Nigeria is the most populous country on the whole continent whose economy is the largest on our continent,” he said. The South African leader said it is important for the two countries to develop and deepen the relationship between them. “Deepen them at a people to people level but also at an economy level and of course underpinned by good political relations between the two countries,” he said. South Africa experienced long years of apartheid regime in which minority whites ruled over the majority black population, leading to long years of struggles. The apartheid regime came to an end with a democratic election held in 1994, which saw the ANC under the leadership of late Nelson Mandela come into power. Mr. Ramaphosa on Wednesday said “today, we are a free and independent country and this is largely due to the support that we got from a number of countries around the world but more especially on the African continent. “Nigeria which is six hours away from South Africa was proudly regarded as a front line state because it was really at the front line of our titanic struggle against apartheid. “Nigeria and indeed Nigerians never flinched for a minute in support of our struggle. In fact Nigerians even took it a little further, President Buhari related that Nigerians through their households contributed money into the Organization of African Union Fund to support the struggle against apartheid. “So, I took time to thank President Buhari and Nigerians for the support that we received during our struggle”. The visiting president also gave an insight of what he discussed with his host. He said they decided to deepen the relations between the two countries. “To this end, we are going to focus on the Bi-National Commission that was set up between our two countries and make sure that the place where it is elevated to at the president level, is where the action should happen,” he said. He also said top officials from the two nations will further discuss the technical part of a number of things related to the Bi-National Commission. He said ministers from both countries will work on the various areas needed to deepen cooperation through agreements. He said after all that, another meeting will be held at the presidential level so that what should be signed by the two presidents will be signed and implementation carried out. “In this regard, we will like to have our next Bi-National Commission in South Africa. I have invited President Buhari to come for a state visit later this year when our Bi-National Commission will then take place,” he said. He also said the meeting exchanged views on a number of important economic matters, particularly with regards to the oil industry and how South Africa can be part of the whole process. He said they also exchanged views on how to deepen trade between the two countries and a number of other areas. “And this new page gives us the opportunity to go beyond where we have been before and find a number of areas we can reach agreements and on this regard make sure that the benefits that should accrue to our people is actually bountiful, particularly in the area of opening up of the African continent through the Free Trade Agreement. And we will be able to ensure that our economies grow by leaps and bound”. Mr. Ramaphosa was asked what his government is doing regarding the frequent killing of Nigerians residing in his country. He said such killings, which he described as criminality, is not restricted to Nigerians alone, but other foreign nationals as well. “I will like to say here and now that, which has been as a result of criminal activity among our own people which we are focusing on from a criminal element point of view. “I want to state here and now that South Africans do not have any form of negative disposition or hatred towards Nigerians; and in the main Nigerians in South Africa and a number of places of our country live side by side, they cooperate very well and some are in the corporate structures of our various companies and some are traders and some are into a number of things. “So, I want to dispel this notion that when a Nigerian loses his or her life in South Africa, it is as a result of an intentional action by South Africans against Nigerians. That is simply not true,” he said. Mr. Ramaphosa said South Africa has a number of challenges, one of which is criminality and which, he said, is all pervasive. He said the government had, however, been tackling crime in the country. He said the high level of criminality is borne out of a number of factors, one of which, he said, is unemployment among the people. “Twenty-seven per cent of South Africans are unemployed which amounts to about 9 million and most of these are young people. “Poverty is still all pervasive in South Africa and this emanates from our very sad history of apartheid misrule. “There is still inequality in South Africa; a few people are extremely rich and majority of our people are very poor and all these factors and other social factors have contributed to the high levels of crime. And criminality is something like I said that we are focusing on, doing everything to bring it down,” he said. The visiting president, however, added that while a great number of South Africans are involved in criminality, many other foreigners, some of whom are Nigerians are also involved. “These are acts of criminality and I want to end by saying that, when we were involved in our struggle, we said that the South Africa that we are fighting for is the South Africa which will regard everyone who lives in South Africa on the basis of equality, respect for human right. “And we said that South Africa belongs to all the people who live in it. So, the Nigerians who are in South Africa are also part of our community. “They can never be targeted on an intentional basis as people who must either be attacked or killed. And when that happens l will like all of us to see that as an act of criminality which in the main affect many South Africans in the various parts of our country,” he said. The host president, Muhammadu Buhari, was also asked why he is refusing to sign the Africa Free Trade Agreement, (AFCFTA), which was signed by 44 countries on March 21 during the 18th Extraordinary Session of the Assembly of AU Heads of State and Governments in Kigali, Rwanda. Mr. Buhari declined to sign the agreement citing reasons to protect the nation’s industries, jobs. “So, in trying to guarantee employment, goods and services in our country, we have to be careful with agreements that will compete maybe successfully against our upcoming industries. “I was presented with the document, I am a very slow reader maybe, because I was an ex- soldier. I didn’t read it fast enough before my officials saw that it was all right for signature. I kept it on my table. I will soon sign it,” he said.